Mother Noella Marcellino in the aging room, holding a wheel of Bethlehem. 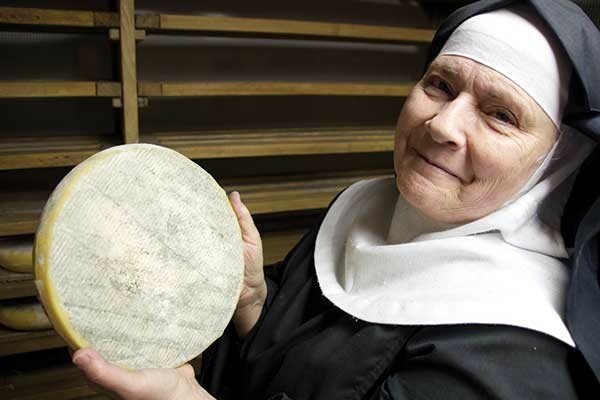 Mother Noella Marcellino has been a Benedictine nun at the Abbey of Regina Laudis in Bethlehem, Connecticut, for 40 years, and has been making cheese for almost as long. In 1977, she received instruction from a visiting French cheese maker, invited by the abbess, in traditional techniques. In 1987, along with several of her sisters, she entered a PhD program at the University of Connecticut. Hers was in microbiology; initially, she planned to get a degree in nutrition, but an adviser, upon visiting the abbey's cheese-aging room, said: "Your doctorate is in this cellar." Subsequently, Mother Noella won a Fulbright to study cheesemaking in France, and ended up staying three more years on a French government grant. Her focus was the Auvergne, in central France (whence her tutor had come years before), and the study of fungal populations in the many cheese caves of the region. Mother Telchilde Hinckley moves the cows to fresh grass. She attained notoriety in 2002, when PBS released "The Cheese Nun," a documentary about her time in France and work at the Abbey. She is most well known for a study she performed after a serious listeria outbreak in the late 1970s, which prompted new requirements that she use stainless steel vats instead of her beloved wooden barrel and stirring paddle from the Auvergne. "All of a sudden, we were finding E. coli in our cheese," she remembers, "after never having a problem with it before." Her experiment proved that the porous old wood, anathema to the regulatory sterility fetish, in fact harbored colonies of the lactic acid bacteria indigenous to the raw milk; their metabolism of milk sugars into acid created an environment in which pathogens could not survive. Despite the attention her work brought her, Mother Noella is quick to deny being a raw milk activist. "It makes better cheese, without a doubt, but it has to be handled carefully." And pasteurized milk is not without hazards, she hastens to add: Contamination after the fact represents a real risk, since sterile milk can easily be colonized by harmful microbes. 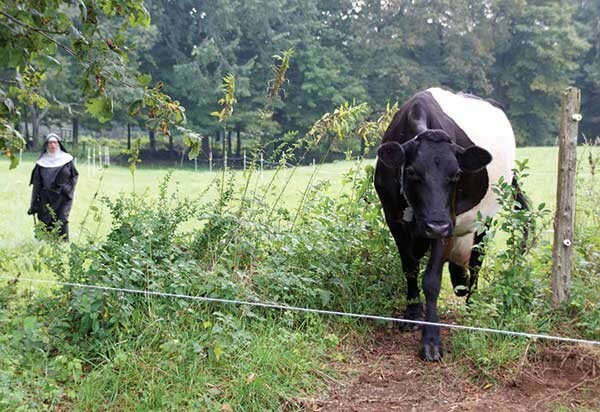 Mother Telchilde Hinckley, who earned her doctorate in animal reproductive physiology, cares for the cows: a small herd of Dutch Belted and one Milking Shorthorn, all rotationally pastured in fields surrounding the dairy. She minimizes the risk of contamination by keeping the animals clean. "We get wood shavings from local woodworkers and change them twice a day, and the cows sleep outside every night, so they lie down on grass." The cows are handmilked every morning, each by a different person, she says, since "we have to fit it in between Lauds and mass." Manual milking is vitally important, she continues, because the Benedictine way of life requires living from the work of one's hands. Every member of the community is expected to find their "elemental area," a facet of the life that grabs their interest and offers them a way in to experience the divine. "When you focus on one aspect of creation and see the mysteries unfolding, you can identify with them and the universe opens up to you." Gwyneth Owen, a former intern who is now a Postulate, stretches mozzarella curds. Regina Laudis has an internship program, with a capacity of about five people, which offers postgraduate adults a chance to immerse themselves in a monastic environment. "We ask for them to give us a year," says Mother Noella. "It's a commitment, but it can be very rewarding." One need not be Catholic, or even female, to be an intern; Brother David Aeschliman interned as a cheese neophyte a few years ago and is now an accomplished cheese maker and member of the community; after leaving to study at Jasper Hill in Vermont, he returned to Regina Laudis as an oblate brother, a lay member. "I rediscovered myself here, through making cheese." Recently he developed a white mold-ripened cheese similar to Camembert, called étoile, which has been added to the Abbey's repertoire. The étoile, because it is aged less than the 60-day requirement, is not legal for sale, but a new pasteurizer, being custom built for the small facility, will change that. It will also allow him to make cheddar all at once, easily, instead of in two pots side by side on the old electric stove in a corner of the kitchen. Though the nuns and their guests eat most of what they produce, some cheese is occasionally available in the Abbey store. Mother Noella strongly recommends that people call ahead to see if there's any in stock. They also sell their pastured beef, as whole cows, to people willing to buy an animal on the hoof and split it with one or more friends. Their herd of sheep provides meat and wool, but no milk; the dairy is strictly bovine. From the raw milk of their five cows, they make a variety of exemplary products: butter and yogurt, mozzarella, ricotta, cheddar, and the new étoile, all in a cramped, low-ceilinged kitchen beneath the barn. The butter, aged as cream for a couple of days before churning, never lasts long enough to develop a tangier flavor, since it gets eaten up. The ricotta, sweet and fluffy, is made when time permits, and without the addition of any milk to boost the yield. Dipped in a bowl of the salt and vinegar-spiked whey, a glistening slice of the fresh mozzarella makes a sublime treat. At three months old, the compelling cheddar boasts a silky texture and mild edge that begs to be aged for a year.